Karen Gapen is a licensed real estate professional who has been practicing real estate in Louisville with her husband, Jeff. The Gapen Team are part of one of Louisville’s most successful real estate firms, Mayer Realtors. Karen’s passion for finding the perfect home for her clients led her to pursue her career in home staging. She is a Louisville native and knows this market, from the up-and-coming neighborhoods to the well-established ones. She knows how to match her clients to the areas of town where they feel at home. She knows how to get your home ready to sell. From offering a comprehensive evaluation and recommendation to providing hands-on staging services, Karen can prepare your home for a quick sale and a great price. For Karen, what started as just sprucing up a bathroom with decorative towels and decluttering turned into a way to not only add value to her clients’ home-selling process, but also a way to help her clients sell their homes faster and for more money. Staging is more than just removing personal photos and clearing surfaces. Staging is creating a feeling for every buyer who walks through the front door. A feeling that this home could be their home. Karen is an EPS certified stager, committed to providing her clients with a distinct advantage over the other sellers. She will help buyers find your home, fall in love with it, and get it SOLD! Karen partners with her husband, Jeff, to form The Jeff Gapen Team. 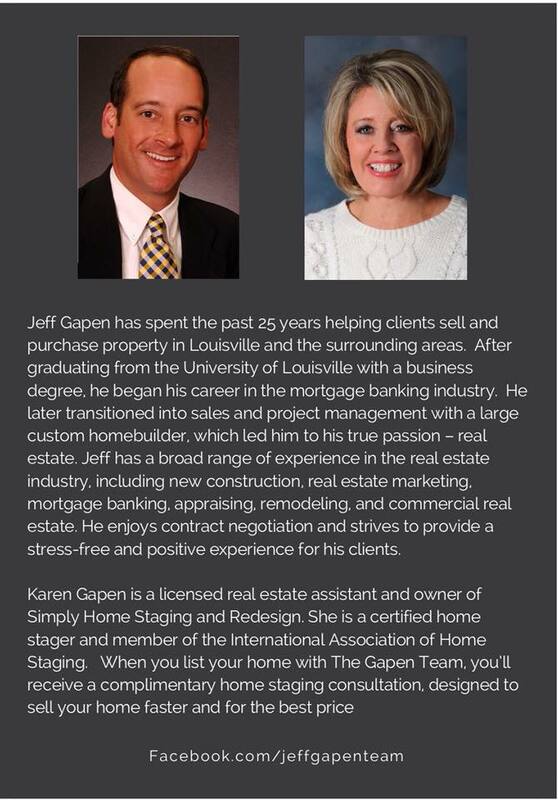 The Jeff Gapen team has been practicing Real Estate in the Louisville area for more than 20 years. Karen's expertise in home staging provides her clients with a Realtor and professional stager all-in-one. She knows the Louisville market. She knows what buyers want. She knows how to prepare your home to sell. Karen's staging career was born out of a desire to provide more value to her clients. According to the National Association of Realtors, a professionally staged home sells faster and for more money. From decluttering, to accessorizing to furniture placement, Karen can transform your property into a showplace that buyers will want to call home.